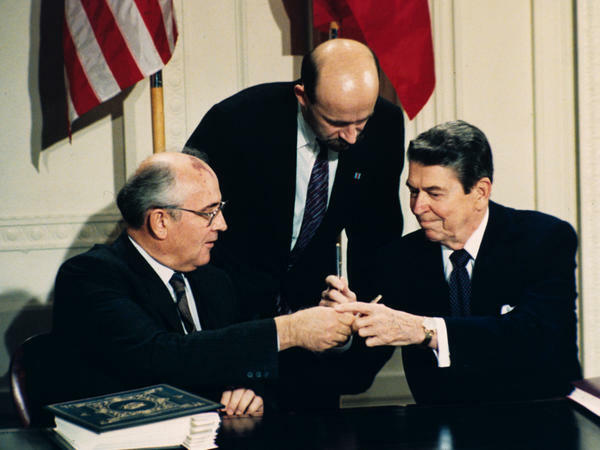 "Trust but verify," President Ronald Reagan (right) told Soviet leader Mikhail Gorbachev before they signed the Intermediate Range Nuclear Forces Treaty. Gorbachev's translator, Pavel Palazhchenko, stands in the middle during the signing ceremony on Dec. 8, 1987. A picture taken on April 20, 2010, shows a Russian nuclear-capable Iskander ballistic missile launcher during a military parade rehearsal outside Moscow. 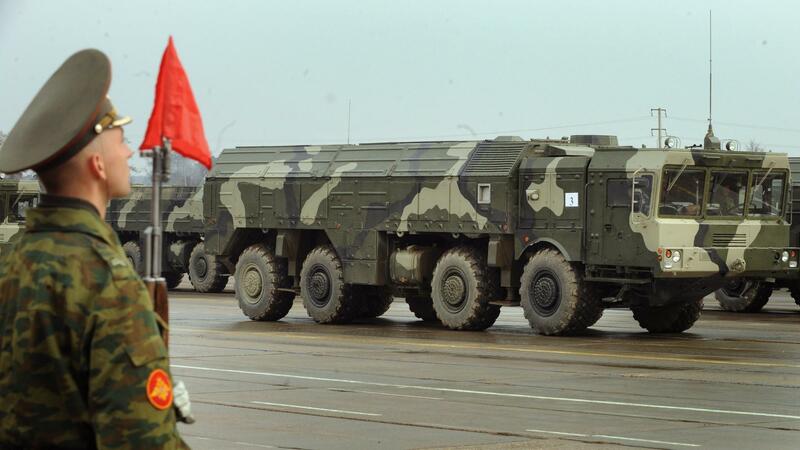 Russia transferred Iskander-M missile launchers within range of three Baltic states earlier this month. The U.S. and Russia are the world's two mightiest nuclear powers, and yet over the years, they've made deals to reduce their respective arsenals. Just like a marriage gone bad, though, things have soured between Washington and Moscow. Bickering over nuclear issues has increased markedly in recent months, with each side accusing the other of cheating. Russia, in early October, moved a battery of nuclear-capable missile launchers within range of three Baltic states. In September, three U.S. long-range bombers — the kind used to drop nuclear weapons — flew over Eastern Europe in NATO military exercises. Russia, in late October, unveiled images of a new intercontinental ballistic missile dubbed the Satan 2, whose warhead, it claims, can destroy an area the size of Texas. "I would have to say that, without question, this is the low point in U.S.-Russian relations since the end of the Cold War," says Steven Pifer, an arms control expert at the Brookings Institution. According to Pifer, a former U.S. ambassador to Ukraine, things began going downhill after Russia's invasion of Ukraine two years ago. They slid further last year with Moscow's intervention in Syria, and this year, got worse with Russian warplanes buzzing U.S. ships and planes in the Baltic — and Washington accusing Moscow of meddling in the presidential election. These developments have other nuclear arms experts worried as well. "We are in a dangerous situation," says Hans Kristensen, director of the Nuclear Information Project at the Federation of American Scientists. "Certainly a situation that is much more dire or tense than it was 10 years ago." U.S.-Russian relations have taken a nosedive from where they were even during the dying days of the Cold War. In 1987, four years before the Soviet Union collapsed, then-President Ronald Reagan welcomed Soviet Union leader Mikhail Gorbachev to the White House to sign a long-negotiated treaty to eliminate the two nations' entire inventories of short- and intermediate-range, land-launched ballistic and cruise missiles and their launchers. Before the two leaders inked the Intermediate Range Nuclear Forces or INF Treaty, Reagan turned to Gorbachev to share a Russian maxim. "Mr. General Secretary," the former Hollywood actor intoned, "though my pronunciation may give you difficulty, the maxim is: doveryai no proveryai — trust but verify." Twenty-nine years later, such trust appears to be in short supply. "Since May 2013, the Obama administration has repeatedly raised concerns with Russia regarding its lack of compliance with the INF Treaty," a senior administration official, who requested anonymity to speak candidly, tells NPR. According to that official, because a series of bilateral meetings to resolve the matter have been fruitless, Washington has called for a rare meeting of the treaty's Special Verification Commission "in the coming weeks." "I actually think this is a good step," Brookings' Pifer says of the decision to take to the commission U.S. claims that an unspecified intermediate-range missile being developed by Russia is not in keeping with the INF. "What the administration has said is that they provided enough information to the Russians so that the Russians could identify the missile in question. The Russians thus far have said no, they haven't got enough information, so you're in that kind of war of words." Part of that war of words was Russia's announcement in early October that it will no longer take part in a joint program with the U.S. to dispose of weapons-grade plutonium. "That, I believe, was a little bit of a poke at President Obama, who attaches a lot of importance to the nuclear nonproliferation agenda," says Pifer. Meanwhile, over the next few months, the U.S. and its NATO allies are to move thousands of troops as well as tanks and other heavy equipment to Estonia, Latvia and Lithuania, countries along and near Russia's border, and to Poland. "This is a gradual sort of escalation of tensions between the two sides that goes beyond discourse and just disagreements over a treaty," says Kristensen of the Federation of American Scientists. "It's getting pretty deep now." What's really needed now, the nuclear nonproliferation advocate adds, is the kind of ongoing dialogue these nuclear powers once had — and now seem to have lost. The U.S. and Russia are two mighty nuclear powers, powers that have made deals over the years to reduce their arsenals. But just like a marriage gone bad, things have soured between Washington and Moscow. Quarrelling over nuclear issues has increased markedly in recent months, with each side accusing the other of cheating. NPR's David Welna reports on how this has played out. DAVID WELNA, BYLINE: Item - Russia, earlier this month, moves a battery of nuclear-capable missile launchers within range of three Baltic states. Item - three U.S. long-range bombers, the kind used for nuclear weapons, fly last month to Eastern Europe for military exercises. Item - Russia, last week, unveils images of a new intercontinental ballistic missile dubbed the Satan 2, whose warhead, it claims, can destroy an area the size of Texas. STEVEN PIFER: I would have to say that, without question, this is the low point in U.S.-Russian relations since the end of the Cold War. WELNA: Steven Pifer is a former U.S. ambassador to Ukraine who's now an arms control expert at the Brookings Institution. Things went downhill, he says, after Russia's invasion of Ukraine two years ago. They slid further last year with Moscow's intervention in Syria and, this year, got worse with Russian warplanes buzzing U.S. ships and planes in the Baltic and Washington accusing Moscow of meddling in the presidential election. Hans Kristensen, who tracks nuclear arms at the Federation of American Scientists, is worried as well. HANS KRISTENSEN: We are in a dangerous situation - certainly a situation that is much more dire or tense than it was 10 years ago. WELNA: Even during the dying days of the Cold War, things did seem better. UNIDENTIFIED MAN: Ladies and gentlemen, the president of the United States and the general secretary of the Central Committee of the Communist Party of the Soviet Union. WELNA: At a 1987 White House signing of a nuclear treaty, President Ronald Reagan strode in with Soviet leader Mikhail Gorbachev. And Reagan declared he had a Russian maxim to share. FORMER PRES RONALD REAGAN: Mr. General Secretary, though my pronunciation may give you difficulty, the maxim is doveryay, no proveryay - trust, but verify. WELNA: The treaty they signed aimed to eliminate both countries' intermediate-range ground-launched nuclear missiles. Twenty-nine years later, Washington is accusing Russia of violating that so-called INF treaty and has called a rare meeting of a special verification commission for next month. Again, Brookings' Steven Pifer. PIFER: What the administration has said is that they provided enough information to the Russians that the Russians could identify the missile in question. The Russians said, no, they haven't got enough information, so you're in that kind of war of words. WELNA: Part of that war of words, Pifer says, was Russia's announcement earlier this month that it will no longer take part in a joint program to dispose of weapons-grade plutonium. PIFER: That, I believe, was a little bit of a poke at President Obama, who attaches a lot of importance to the nuclear nonproliferation agenda. WELNA: Meanwhile, over the next few months, the U.S. and NATO allies are to move thousands of troops, as well as tanks and other heavy equipment to nations along Russia's western border. Arms control expert Kristensen expects that action will provoke yet another reaction from Moscow. KRISTENSEN: This is a gradual escalation of tensions between the two sides that goes beyond discourse and just disagreements over a treaty. It's getting pretty deep now. WELNA: What's really needed, he adds, is the kind of dialogue these nuclear rivals once had and now seem to have lost. David Welna, NPR News, Washington. Transcript provided by NPR, Copyright NPR.